The 2018 AusBiotech Conference was held in the booming city of Brisbane in the sunshine state of Queensland. This year’s conference was a particularly exciting and a special event for CCRM Australia, as it was our first time as a sponsor of the conference. Notably, we were proud to support the regenerative medicine stream of seminars held on the first day of AusBiotech. 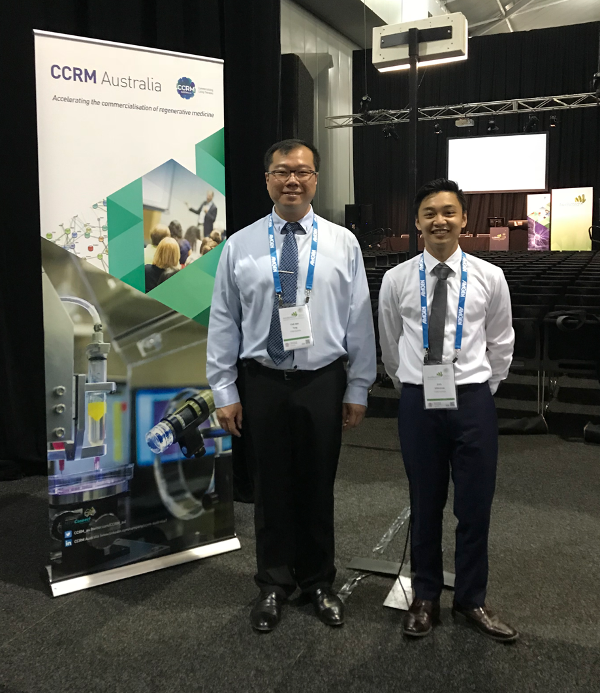 COO, Dr Chih Wei Teng and Project Officer, Erick Villaceran, preparing to welcome attendees for the regenerative medicine stream. The three-day event featured speakers from all over the world with sessions covering many topics across the life sciences industry. In the field of regenerative medicine, there were sessions on the outlook of the sector, from both a local and an international perspective, as well as a seminar that shared translational success stories from Australian regenerative medicine companies. A number of major announcements were made at AusBiotech, starting with MTPConnect releasing their report Regenerative Medicine: Opportunities for Australia, to which CCRM Australia contributed, alongside LEK and World Courier. This was followed by the NSW Stem Cell Network releasing their updated report Snapshot of Stem Cell and Regenerative Medicine Companies in Australia, in addition to the announcement of the establishment of RMLink, an Australian-Japanese researcher directory by AusBiotech. Panel discussion on enhancing engagement with commercial partners and the regulator to improve the success of translation activities. CCRM Australia’s CEO, Silvio Tiziani, chaired a session with speakers from the local regenerative medicine sector including John Martin from Regeneus, Craig Newton from Vivazome, Prof Paul Simmons from Mesoblast and Prof Alan Trounson from Cartherics. Attendees were able to hear of insights into their translational stories. AusBiotech and Forum for Innovative Regenerative Medicine (Japan) announced the formation of a database initiative called RMLink, which originated from the MoU signed in 2017. This initiative aims to facilitate collaboration between scientists from Japan and Australia. CCRM announced the successful opening of their new cell and vector manufacturing facility. The release of two significant reports for Regenerative Medicine byMTPConnect and NSW Stem Cell Network. It was a great opportunity for the CCRM Australia team to take part and network with delegates across the nation and the world. We are excited for the 2019 conference which will be held in Melbourne, and CCRM Australia looks forward to showcasing the progress of the Australian regenerative medicine sector next year. Till & McCulloch 2017 registration now open!